Home Facebook Privacy Facebook Tips How to HOW TO: Manage Your Facebook Friends Requests? HOW TO: Manage Your Facebook Friends Requests? This is mother of all Facebook tips I have published so far. Many times it so happens that we send friends requests to many people. Some of them are intentional some of them are accidental. We send friends requests and even forget about it. I had received tons of queries how to mange all your friends requests and how one can see all the pending friends requests. I was searching for a solution and today I got lucky. 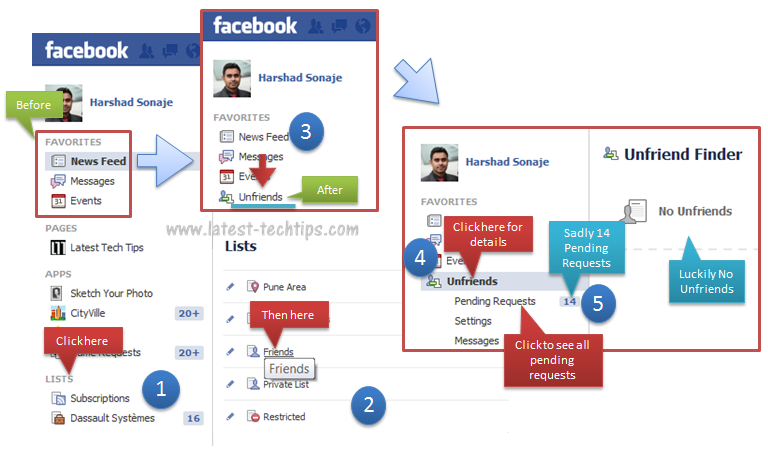 Finally I got a solution which will enable you to manage your Facebook Friends requests. Find how many people have un friended you on Facebook? How many of your friends requests are pending (Not Yet responded)? Officially there is no provisions from Facebook to get what you want in this case, but there are very good workarounds which you can use. Just follow these extremely simple steps to find all your accidental, pending friends requests on Facebook. First of all log into your Facebook profile. 1. Just install a Facebook Browser plugin called www.unfriendfinder.com, Give necessary access. 2. Its a Browser Script which gets integrated with your Facebook profile. 3. Once you have installed the script simply go to your lists. 5. Automatically you will start seeing a extra menu in your favorite menus called Unfriends. 6. Just click on it and you will see 3 sub menus which has all what you were searching for. Now you know whom you had sent friends requests and who is the one who unfrieded you on Facebook. NOTE: This script is stored on your browser as a plugin and then integrates with Facebook. So if you think it will work everywhere you log into your Facebook account then you are wrong. You have to re install the script every time you use a new computer or browser to access Facebook, but I am sure its worth the effort. Keep this trick a secret if you have unfriended anyone .